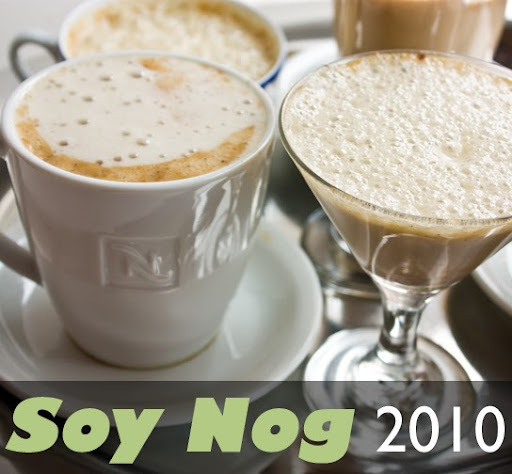 Holiday Recipe: Spiced Vanilla Bean Soy Nog! I crafted this recipe for the first time last year. And this year I decided to do it again with a few tweaks. For my Soy Nog recipe last year (for my 12 days of vegan treats series), I wanted to add body to my nog, so I added in a mashed up banana. I was shocked by how delicious and creamy the banana made my nog. It tasted slightly sweet in a tropical island-kissed way. But this year I wanted to give the nog a more pure-vanilla, spiced accent. History of Egg Nog. As I researched the origins of egg nog the basics come out to this: egg nog was originally a highly alcoholic beverage that is meant to be bold, rich and filled with robust spices. Nutmeg and cinnamon are the classic egg nog spices. Spiced and Spicy. One of the interesting notations about the history of egg nog is that it was once meant to be a very spicy beverage. 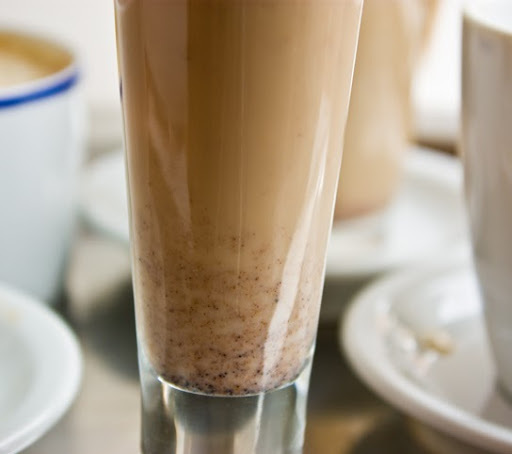 Nowadays, you don't think of eggnog as a spicy drink, but rather simply accented with warm mellow spices. 1. Scoop vanilla seeds out of pod. Set aside, carefully. 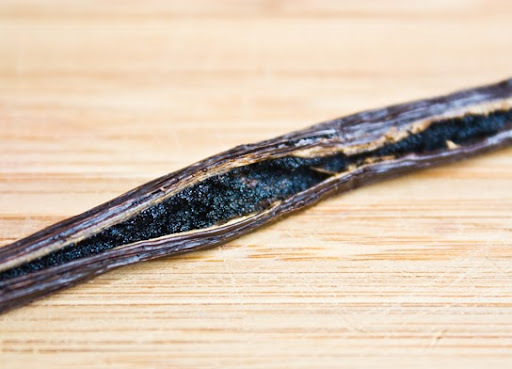 Keep the vanilla bean pod for the next step! 2. Add the soy milk and water to a small soup pot. Add the sachel of mulling spices and bring to a low boil. Also add in the leftover vanilla bean pod. Reduce to a simmer and cover with lid. Allow to simmer for about 5 minutes. 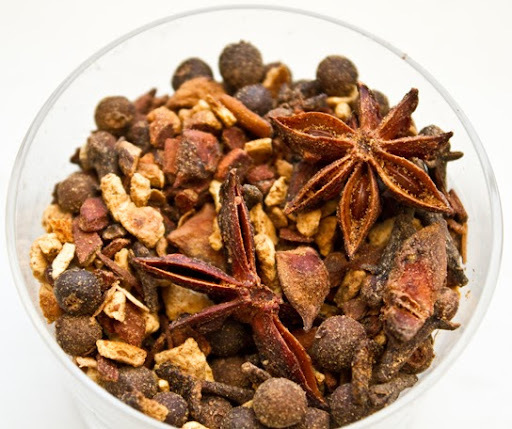 Remove mulling spices or strain out through a strainer. 3. Keep your spice-infused mixture on the stove top - simmering - and add in the remaining ingredients. Stir together. 4. Leave the nog covered over very low heat until ready to serve. 5. Prepare your sweet foam topping by using a mini foaming wand - or you can also use a blender for a 'frothy' topping. Heat the milk/cream/syrup to warm temp and foam. Set aside for serving. 6. 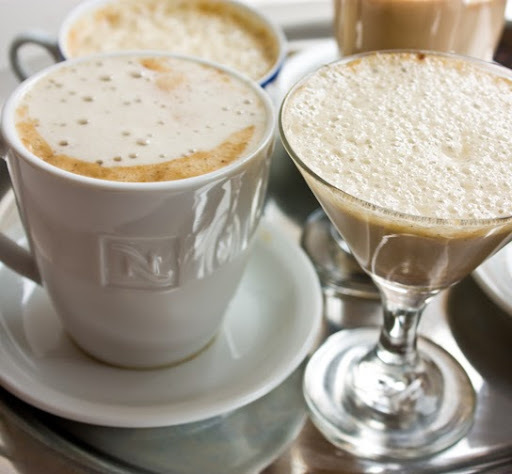 Pour nog into serving cups/mugs - top with a dollop of foam and a dash of cinnamon. Optional for adults: Brandy.